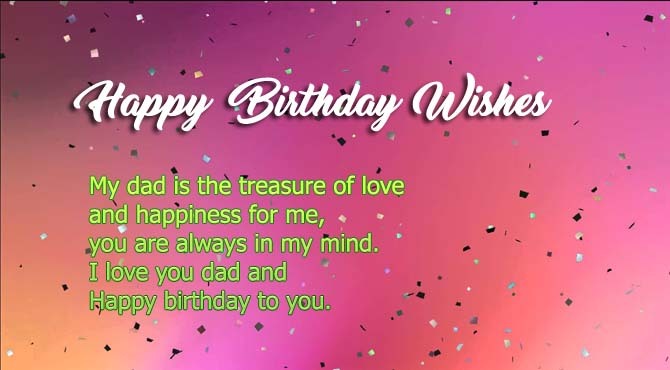 Happy Birthday Messages for Dad from Daughter: Dad is one most effective person, who plays the leading role in his daughter life. Without father’s support they can’t achieve high success in their life. Being a daughter you depend on your father some time directly and sometime indirectly no matter you are married or unmarried. The only person on earth who works day and night to fulfill the requirements without any remarks is father. Father is the priceless gift from God, its starts caring even when you don’t open your eyes. So wish your father and thanks them for making such a great effort for you in making you strong and successful. Here some of the heart touching messages which will helpful for you in expressing feelings about your love. The life I get is not possible if you are not there to support me, thanks dad you live long and happy. Happy birthday to dad whom I love the most. You always did best for us, whenever there is tough and difficult scenario, I love you dad. Happy birthday to dad which give his 100% to make me strong. Today I got the chance to thanks you from the core of my heart you are fabulous and a great man. 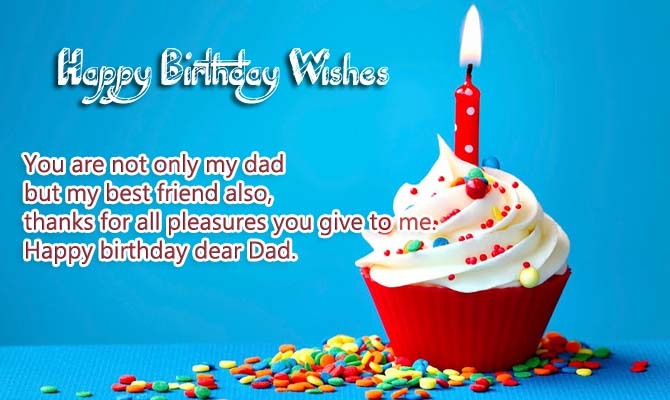 Happy birthday to dad and you are only great dad is the world. You hold me whenever I was falling. You helped whenever I needed. I promise you that I will be also there whenever you need me. You are the loveliest father in the world. You ruined your sleeps for making me sleep, you left your loved things to provide me mine, you always hide your tears to make us happy, I can’t express the love of my father in words. Father! I loved a person from my childhood. I hide it but now it’s time to tell you about that. He is the prince of my life, he flows in my blood and I can’t live without her. And he is my father. Everyone hates falling. But I always liked to fall, you know why? Because whenever I falls I see my father there in front of me. Standing me up for the struggles of life. You teach me a lesson which I not taught in school or anywhere else, to stand back strongly after failure really thankful to you. Happy birthday to dad and my first my love. When I was little baby, I always used to think that I will become a hero for the world. I still thinks to be but my hero’s definition is changed now, definitely my father is my hero now. Everyone have a friend, anybody can’t live without a friend, and after a friend there comes a best friend who is like our own body part. But the best friend I got in my life was always my father. Successful life may mean all the facilities of life but no one knows the importance of common relations in our life. I always saw you as a purpose of living and destination of my life. God blessed me with a lot of things for which I am thankful but the most precious thing I got in my life, is you father. I always wanted to be with you and spend my whole life with you. A life full of happiness is always preferred but a life without father is of no importance. I can happily leave all the happiness of life for my father. When I was little I always wished to be older but now I came to know that incomplete homework and broken toys are better than broken hearts. Love you dad. Whenever I do a hard task I feel weak but whenever I start it I can feel you supporting me and behind me. Thanks dad for always caring about my emotions and feelings. I can’t send the gift which you deserve, but I can only thanks for all those memories and care for me. Happy birthday to one and only great dad. Your love is truly unconditional, the way you made us for victory and glory is magnificent. Happy birthday to dad which supports me a lot. May you see a hundred years of life with happiness and prosperity. May Allah bless you with respect, health and wealth and may you always be with me. I got a lot of best things in my life, but the most precious thing of my life I ever got is my father. May you never face any problem in life. Today I thanks to you, my all victories and glories happens just as you supports me, you are always there to support me and encouraging me. 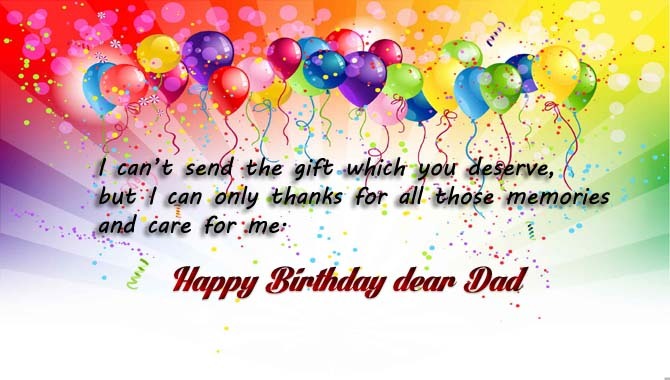 I love you from the core of my heart and happy birthday to dad. My dad is the treasure of love and happiness for me, you are always in my mind. I love you dad and happy birthday to you. What I am is always because of you. You gave me identity. I am always known y your name. You are the one to provide me with meanings of life. I will always try to keep your name safe and respectful, being a good son. It’s too amazing for me, that I got your DNA, you personality is my inspiration love you and happy birthday to dad. You are not only my dad but my best friend also, thanks for all pleasures you give to me. Happy birthday to dad. Father may be a simple word but no one knows what it takes to be a father. A father is like a God who provides us with all the needs and necessary things whenever we need, no matter how bad we are. Father! You always took care of me. Thanks for all the love and care you gave me. I think you are most adorable dad ever in the universe, which God has created for me. Happy birthday to my dear dad. Happy birthday to my respected dad who does everything for me, no matter how tough is it. Love you dad. 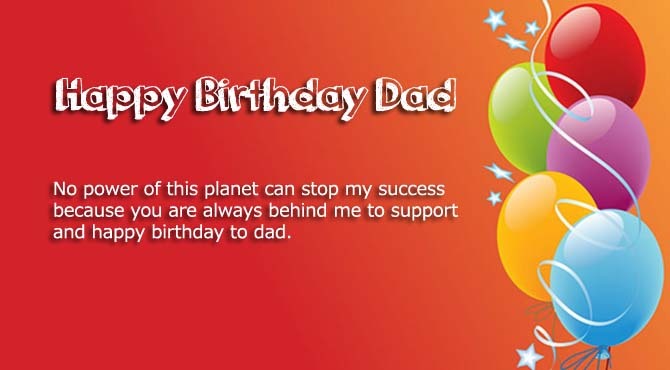 No power of this planet can stop my success because you are always behind me to support and happy birthday to dad. When i was little I thought my father is cruel to me. But with the time I realized that I was a diamond under preparation and my father was the one who prepared me as a diamond. Thanks father for punishing, scolding and specially loving me. Happy birthday to dad whose first name is love second name is care and third name is joy. Happy birthday to dad. You are the reason behind all my success and happiness, you make me great, I love you and Happy birthday to dad. The way you love and care for me is comment less, you support me in every aspect of life. Happy birthday to dad. Everyone knows me as a weak, useless, and little and duffer child but with all these factors there is a personality who believes in me, trust me and encourages me to prove them wrong. I am the most talented and useful personality for him. He is my father, the motivation of my life. Dear dad I just want to ask one thing, you are my million colors of joy and happiness. Happy birthday to dad. The precious gift of the universe is love and affection which you gave to me. Happy birthday to great dad. You are not only good husband and friend but dad also. Happy birthday to great dad. Enjoy this day with full attention you are always been an inspiration for me. Happy birthday to respected dad. 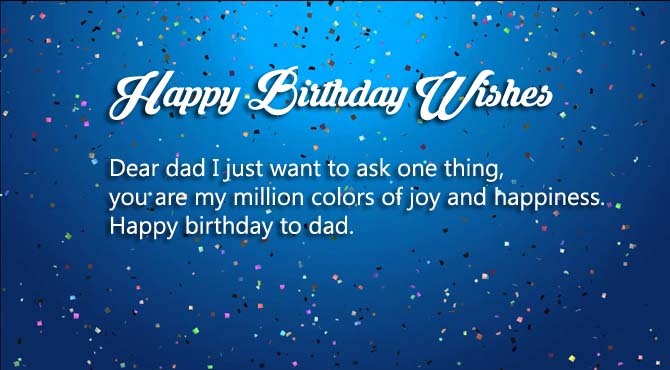 Thanks for unique birthday wishes, i am looking for my dad wishes.